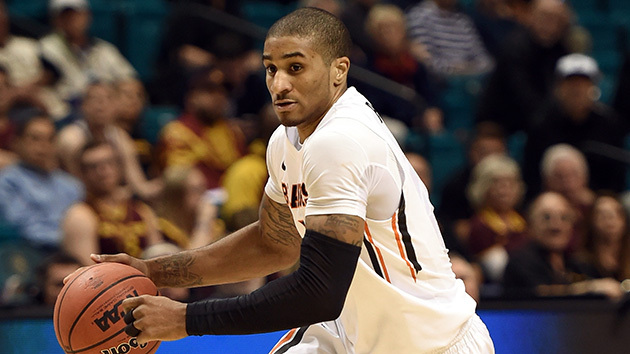 Everything you need to know about the Oregon State Beavers as they begin the NCAA tournament. The Case For: The name of the today’s college basketball game is efficiency, and you’ll struggle to find a more efficient, more productive player than Gary Payton II. The son of the best player in OSU program history, Payton II is a good on-ball defender and a tremendous off-ball defender. He does everything for OSU, even if it doesn’t all show up in the stats: He is great not just at grabbing boards but keeping balls alive with tip-outs to teammates, and he deflects tons of passes. But the star veteran isn’t the only guard who produces for OSU. The Beavers also get big-time production from their rookies. Freshman Stephen Thompson Jr. (the son of former Syracuse star and current OSU assistant Stephen Thompson Sr.) has won two games for OSU in the final seconds, with clutch free throws to beat Utah on Feb. 4 and a buzzer-beater against Washington on Feb. 24. He also scored 23 second-half points at UCLA on March 5. Thompson Jr. (10.8 ppg) is a perfect example of a new kid not knowing any better: He has played all season with big-shot confidence, ignoring the notion that a rookie is supposed to take time to adjust. And freshman point guard Derrick Bruce looks ready to contribute regularly (team-best 54.3% from three) after scoring 25 points off the bench in a Pac-12 tournament quarterfinal loss to Cal. The Case Against: Talk about lack of experience: No Oregon State player was even alive the last time the Beavers went dancing in 1990. And no player on this roster has significant postseason experience, having lost in the quarterfinals or before of the Pac-12 tournament the last four years (the CBI does not count as legitimate or significant postseason play). The Beavers don’t rank high in any statistical category (203rd in scoring offense, at 72.1 points per game; and 128th in scoring defense and field goal percentage defense, at 70 and 42.7%, respectively). OSU goes stretches without being in sync defensively, which usually results in offensive spurts for opponents. While GPII can stuff a stat sheet, he has a tendency to disappear when not playing at home. That results in Oregon State struggling to dig itself out of holes. What’s worse is that the Beavers will likely be without freshman forward Tres Tinkle (13.1 points, 5.4 rebounds), who has missed the last four games with a right foot injury. Tinkle and Thompson Jr. were consistently OSU’s most aggressive players, which doesn’t say much for the upperclassmen. OSU could be in big trouble if it meets a good big man. The Beavers start two 6'10" players in freshman Drew Eubanks (7.4 ppg, 4.5 rpg) and senior Olaf Schaftenaar (6.5 ppg), but if Eubanks gets in foul trouble, Schaftenaar is much too soft to push anyone around the paint.